Figure 1: This is an awesome 1/6 figurine depicting an African American soldier from the famous 54th Massachusetts Volunteer Infantry, after the Battle of Fort Wagner. The piece is titled “De Regreso Del Inferno” (“Back from Hell”). This is from the Spanish language site Acción Uno Seis: foro español di figuras de acción a escala 1/6 (Action One Six: A Spanish Forum for 1/6 scale action figures). It shows a Union sergeant who holds the tattered, but surviving, United States flag in the wake of the battle. From the site Acción Uno Seis (translated from Spanish): “The 54th Massachusetts Volunteer Infantry regiment won international fame on July 18, 1863 for leading the assault on Fort Wagner near Charleston, South Carolina. In this battle, Colonel Shaw died along with 116 of his men. 156 others were wounded or captured. “Although the Union was not able to take the fort, the 54th Massachusetts was widely hailed for his courage, and the event it helped spur enlistment and mobilization of African-Americans to join the Union Army. This was a key factor in the conflict. President Abraham Lincoln said the support of African-American troops had facilitated the final victory. => For more images of this figure (10 in all), please go to the website Acción Uno Seis. The old Flag never touch’d the ground. It never touched the ground. Per Wikipedia, Boys the Old Flag Never Touched The Ground is a patriotic song that celebrates the heroism of Civil War Medal of Honor recipient Sgt. William H. Carney of the famous 54th Massachusetts Volunteer Infantry during the Battle of Fort Wagner. The song was written by Henry Mather and George E. Lothrop after Carney’s death in 1908. 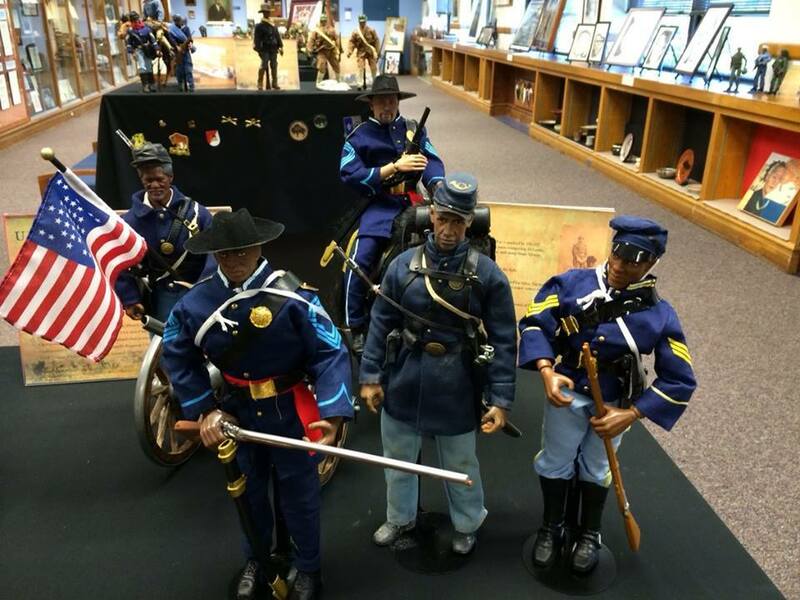 Figurines of United States Colored Troops from the American Civil War. Image Source: United States Colored Troops Living History Association, added on January 18, 2015. 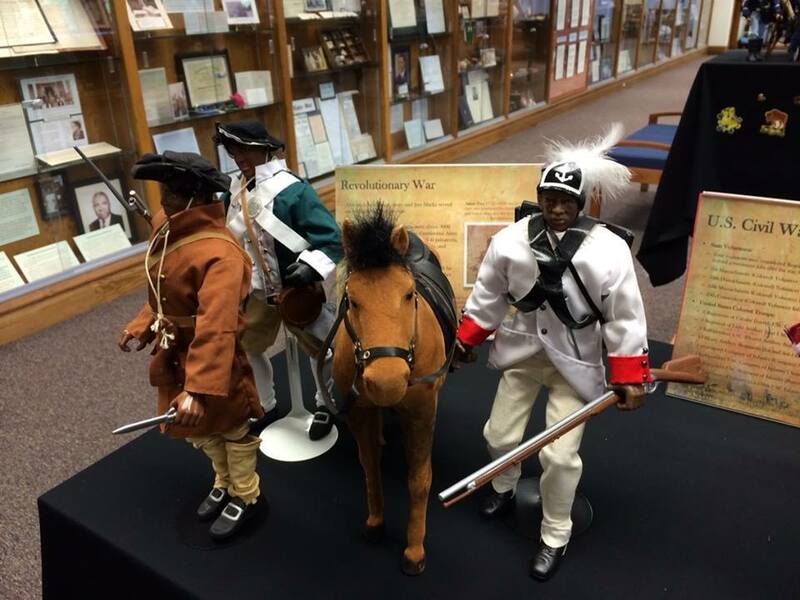 These are pictures of some very cool figurine displays that were posted to the Facebook page of the United States Colored Troops Living History Association. Unfortunately, the site of these displays is not clearly identified. Too bad; I’d love to see them in person. If anybody knows where these are, please drop me a line. Figurines of soldiers from the American Revolutionary War. The figure to the far right is wearing the uniform of the First Rhode Island Regiment, which fought with the Patriots. I suspect this scene is based on the story of Henry “Box” Brown, a 19th-century Virginia slave who escaped to freedom by having himself mailed in a wooden crate to Philadelphia, Pennsylvania abolitionists.